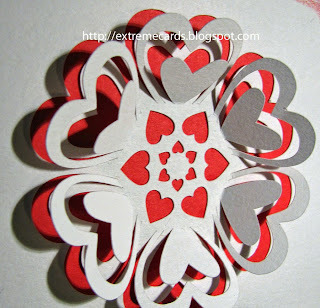 This paper flower valentine is composed of multiple hearts that spring up into 3D petals. Optional sentiment frames included. Download file set: PDF, DXF, Silhouette Studio, SVG (how to use my files in Cricut Design Space). Files download for free; pay what you wish for the tutorial and to support this site. Suggested contribution for this project is $1. 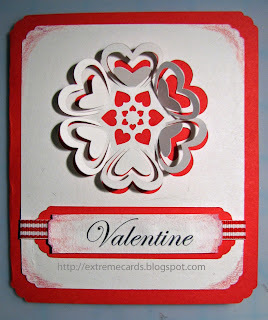 Cut flower petal front from one color (I used white) and base card from another color (I used red). Cut sentiment frames if you wish. 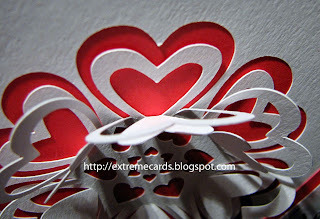 Each petal consists of three parts: an small solid heart and two larger heart frames. Bend up the solid heart and the outer-most heart frame. Leave the medium-sized heart frame flat. Fold base card along center score line. 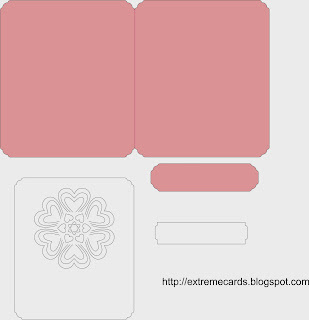 Glue flower front to front of base card. Add sentiment frames if you wish.